Back in 1997, Virgin Atlantic started offering Flying Without Fear courses at £199+vat. They claim to have 98% success rate. 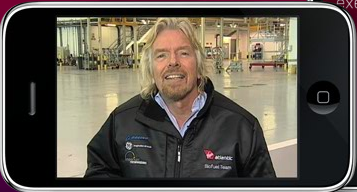 Sir Branson wants to replicate the success of these course with an iphone application and he does a personal introduction on the app. The app is not for free (4.99$ at Apple Store) and it has even a “fear attack button” for emergencies with breathing exercise and quick tips, together with personalized program with daily advice and exercises, preparing you for your next flight. Virgin has also published a book “Flying Without Fear 101 questions answered“. Considering that according to Boeing study, one of every three adult Americans is either anxious or afraid to fly, does airlines need to invest on these tools to revert falling revenues trend?